Rare stone house of about 350 m² largely on one level, on a plot of over 2000 m² in the center of the village of Gordes.We enter a hall with cloakroom and toilets, open on a beautiful living room almost square with fireplace. A wide hallway distributes a beautiful fitted kitchen with back kitchen, a wrought-iron awning to the south, and a formal dining room. In the continuity, the bedroom I with dressing, office and bathroom + toilet, a passage and a second fitted kitchen, then a small laundry room and a separated toilet.A staircase gives access to a small TV lounge / library, bedrooms II and III with a bathroom + shower and separate toilet.From the west gable, an external staircase accesses a separated apartment including a living room, a bedroom IV and a bathroom with toilet, as well as a small terrace in the south.Below, the heated pool with automatic cover (8 x 4 m) is surrounded by paved and grassed beaches. 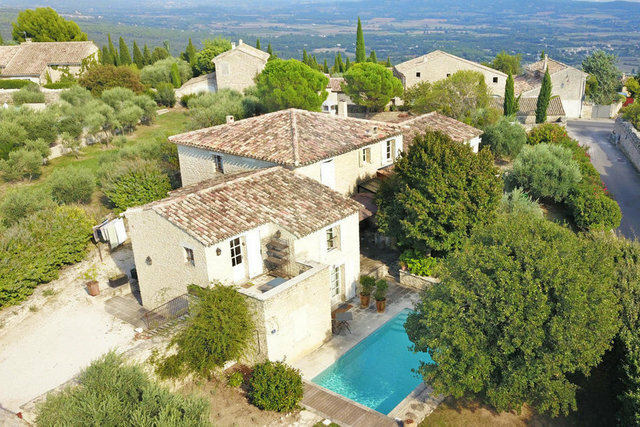 A spa area includes a jacuzzi and a sauna / steam room in a small stone borie.The garden includes a neat part in front of the house and another more rustic on the side, planted with olive trees, almond trees and other local species. A large parking allows to park the vehicles at home, and can be used as a petanque if necessary ... and a large stone garage completes this property with high residential or commercial potential.